No. 369: Matilda – Originally from Melbourne, Australia, this streetcar now rolls up and down McKinney Avenue in Uptown Dallas. As someone who loves history and public transit, one of my favorite things to do in Dallas is to ride the streetcar. 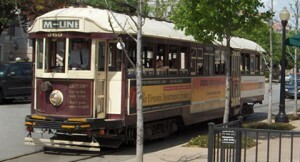 The McKinney Avenue Transportation Authority (MATA) runs several historic trolleys through Uptown Dallas. It’s a lot of fun, so I wrote an article about it for Dallasing.com. This is only my second guest post for another blog, and I’m proud to show it off. Dallas used to have streetcar lines throughout the city. These started out as mule-drawn trolleys in a Wild West town. Over time, the city electrified the lines with overhead wires (catenaries). But soon the Automotive Age came to dominate. Dallas scrapped its trolley network in 1956. A generation later, they dug up some of the old tracks and revived the McKinney Avenue Line. Today, it exists mostly as a way to shuttle around tourists and drunks. If you’re looking for something cheap and fun this weekend, or anytime really, check out the M-Line in Uptown. And don’t forget to visit my friends at Dallasing.com for more information. Have you ever ridden the McKinney Avenue Trolley? What about other streetcars, vintage or modern? Let me know your thoughts in the comment section.